The ever-adventurous Del Sol String Quartet teams up with didjeridu visionary Stephen Kent on this collection of works by the pater familias of Australian music, Peter Sculthorpe (1929–2014). Sensual and contemplative, spiky and wild, the works—like Sculthorpe’s entire oeuvre—channel the spirit of the vast Australian landscape and the myriad stories it has witnessed. The release includes a bonus Blu-Ray in surround sound to enhance the sonic voyage. The Del Sol String Quartet continues their joyous exploration of non-European music on their seventh studio album—Peter Sculthorpe: The Complete String Quartets with Didjeridu. Born out of a collaboration with the composer and the exceptional didjeridu player Stephen Kent at the Other Minds Festival in 2006, the recording is a stunning history of place in sound, with the deep hum of the aboriginal drone pipe as the sound of the earth itself. It is also a poignant tribute to Sculthorpe, who passed away in August 2014. Sculthorpe, extremely sensitive to the fraught history between the continent’s indigenous people and the European colonists, long refused to integrate the didjeridu into his works, until the aboriginal didjeridu player William Barton requested a piece (although Sculthorpe had himself been approached with the suggestion of such a collaboration by Kronos some years before). The result of that request was the single-movement String Quartet No. 12, “From Ubirr,” – a fierce and ritualistic re-imagining of Sculthorpe’s earlier orchestral work Earth Cry and the first track on this CD. The exotically pastoral String Quartet No. 14, “Quamby” follows, inspired by a story of Australian colonial history Sculthorpe’s father told his son during the composer’s self-described “solitary but otherwise idyllic” childhood in Tasmania. The plight of Afghan refugees, held by the Australian government in remote, desert detention camps, informs String Quartet No. 16, whose five movements with titles like “Loneliness”, “Anger” and “Trauma,” feature some the hardest, most dissonant music the composer ever wrote. Sculthorpe returns to the earth in String Quartet No. 18, in which the music-century hymns and wild animal calls. 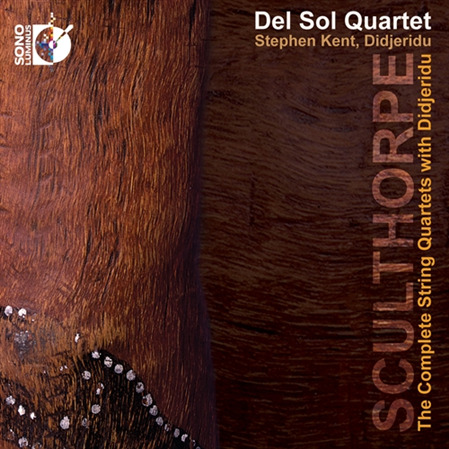 Because the spirit of place is such an integral quality of these pieces, Del Sol is excited to include a surround-sound Blu-Ray with the CD, allowing the listener to become completely immersed in Sculthorpe’s wild outback landscapes, as the strings are by the didjeridu. Sculthorpe believed that what was extremely local had the greatest capacity to speak universally. Thanks to this recording, his work can finally receive the universal recognition that he deserves as one of the great compositional voices of the past century.